Have you ever made a small social mistake, and then you replayed it in your head over and over again? Maybe you said something a bit awkward. Maybe your voice sounded a little weird. Maybe someone gave you a small rejection — like avoiding talking to you. And now your mind is torturing you. It can’t let that moment go. You dwell on that mistake obsessively. Thinking about what you could have or should have done differently. Over and over again on repeat. You just can’t stop this for some reason. It’s like watching the most uncomfortable movie in the world repeatedly. And the worst part is: YOU are the star of this terrible movie! Ouch! What a miserable way to live. That’s a photo I took just a few minutes ago. 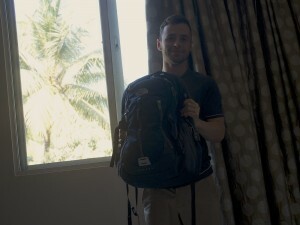 It’s me holding the backpack I’m using to travel in India (and later other countries) for at least several months. 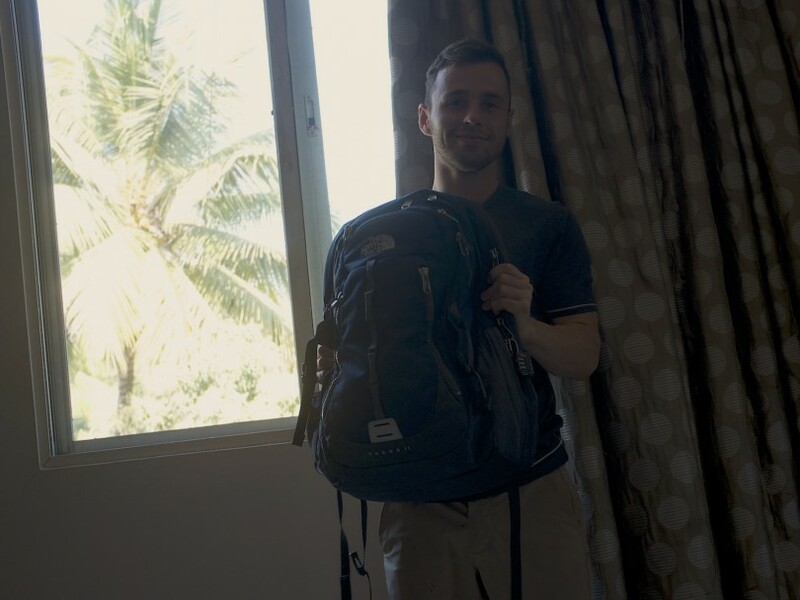 Yes, that small backpack is it. That’s everything I own right now. I have no other baggage. Why am I mentioning my backpack? Because I believe that light baggage gives you freedom. Not just in travel but in life. Many people carry around a huge amount of old mental baggage through life. You carry around your past hurts, failures, shameful embarrassments and minor screw-ups. And this gigantic baggage in your mind makes you feel depressed and low self esteem. It stops you from expressing yourself authentically right now to other people. It shuts you down with fear that you may shame or embarrass yourself again. Most of us believe that WE are the ones in control of our minds. You believe that you control what you think about and how you feel. That’s not really true. Your mind is NOT a modern invention. Your mind has been designed over millions of years of evolution to help you do 2 primary things: survive and reproduce. Your mind exists to improve your chances of either surviving or having babies so you can pass on your genes to future generations. Many negative emotions like fear, anxiety, anger and jealousy come from these 2 big unconscious drives: Survival and reproduction. When you feel afraid when a big dog suddenly barks at you, that fear is meant to help you fight the predator or run away to safety. Survival. When you feel jealous about your romantic partner spending lots of time with someone else, that jealousy is meant to help you improve your chances of reproducing. When you feel anxious about walking down a dark empty street alone, that anxiety is meant to help you remain alert for any strange dangers in a new environment. Now, it’s easy to see how an emotion like fear is related to survival. It’s a little harder to understand why your mind’s habit of replaying embarrassing or awkward moments is related to survival. But it is. The key here is SOCIAL REPUTATION. And that’s why your mind has been designed to be obsessed with your social reputation. So when you say or do something that DAMAGES your reputation or status, your mind goes nuts. In all these situations, your mind believes you have damaged your social reputation or social status somehow. So it remembers the situation over and over again because it does not want you to repeat the same mistake again. It wants you to become better at preserving and enhancing your social status. Your mind keeps you thinking about your past social mistakes and awkward moments because it wants you to learn how to avoid making the same mistakes in the future. It wants you to avoid lowering or damaging your social status, because a good social reputation means better chances of survival or mating. Now that you understand the true cause of your problem better… how can you fix it? Many people try to force themselves to suppress or “push down” the memory. This approach doesn’t work for 99% of people. I tried that myself for years, but still my mind kept returning to those embarrassing memories. So clearly that doesn’t work. Get out of your mind and into your body. This is amazing advice right here. I believe that exercise is a good TEMPORARY way to “get out of your mind.” It quickly puts you in touch with your physical body. When you are running or lifting weights with a lot of focus and intensity, it does take you out of your mind. Out of all your mental problems, worries and stresses. That’s a big reason why some people love fitness or sports so much. This is already the basis for many therapy and meditation techniques. “Most therapies encourage intellectualizing: talking about the irrationality of patient beliefs, talking about the behavior changes the therapist believes that the patient should make, and so forth. 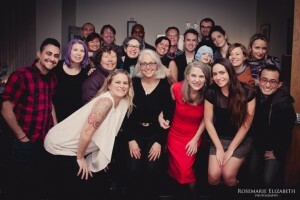 Some of the therapists at the Gestalt Therapy Center in New York. Gestalt therapy is all about giving LESS attention to your symbolic thinking: your mental interpretations and your explanations for the past… and MORE attention to what is being felt or perceived right now. The focus is on what is being done, thought and felt at this moment rather than on what was, might be, could be, or should be. About one year ago, I went to a 10 day silent meditation retreat which taught me the technique of Vipassana meditation. For 10 days, I couldn’t talk to anybody or even look at anybody in the eyes. No communication allowed. No cell phones or computers allowed. No books allowed. Just hours and hours of meditation practice every day. Day after day. From 6AM until night, with breaks for eating light vegetarian food. 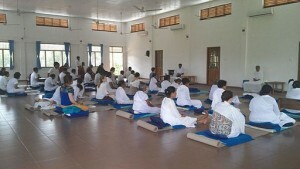 A group of people doing vipassana meditation. Photo Credit. Vipassana meditation has nothing to do with belief in the Buddha or some god. It is just a technique to observe yourself. On that 10 day retreat, I started out observing my breath. Watching it going in, going out. Hour after hour. Then we were taught to scan our bodies from head to toe. This means literally “scanning” your attention throughout your body, and noticing what sensations you feel everywhere. But very effective at getting you in touch with your living and breathing body/organism… instead of living in the abstract world of your mind which includes your social reputation/identity. The best thing you can do to stop obsessing about past mistakes or embarrassing moments is redirect your focus/attention. Where and how do you redirect it? You take a moment to notice something happening in the physical world right here and now. For example, right now feel your fingers on your keyboard. Pay attention to that sensation at your fingertips for a few seconds. Or you can pay attention to your breath going in and out. You don’t need to suddenly breathe differently, just become aware right now to how you breathe normally. Or if you’re walking somewhere, pay attention to your movements. Can you make every movement of your arms or legs conscious instead of automatic? By redirecting your focus in any of these simple ways, you become more in touch with your physical existence. You become aware of what you are sensing and feeling right now. Redirecting your focus to physical sensations and feelings brings you into the present moment, instead of uncontrollably remembering the past. The past is the past. You cannot change something that’s already happened. You can only control your state of mind right now. And instead of being constantly terrorized by memories that make you feel bad or ashamed of yourself right now… you can redirect your focus into the physical world and reality. Think about it: Will your awkward mistake matter 5 years from today? Then why should it now? This is just a VERY quick overview of these types of techniques. I highly encourage you to check out the book “The Power of Now” if you want to learn how to really make these techniques a part of your daily life. There is also a section in my Shyness and Social Anxiety System, which will show you the 2 BEST techniques to get out of your mind in this way. Hello Sean, Very practical tips. Thank you. One thing that came to my attention is the word ‘Mind’ that you have used as in “Your mind has been designed over millions of years of evolution”.I think it should be ‘Brain’ instead. Mind is part of consciousness or being . Brain is part of physical body. I know in normal sense many use both the words to refer the same thing.but i think they are quite different. Hey Govi, good point. 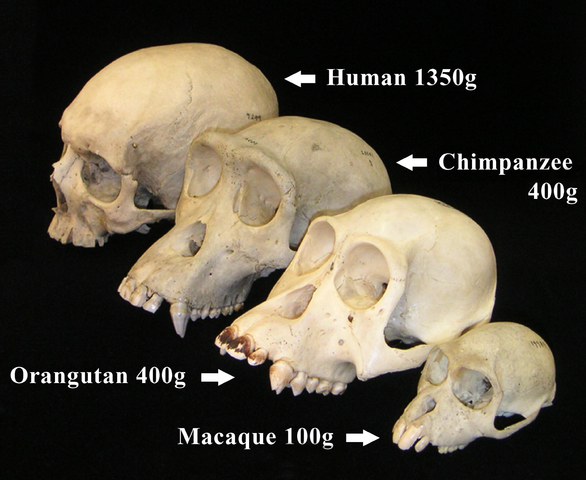 Usually people use the word “brain” when talking about evolution and biology. In this article, by “mind” I mean the thoughts and images that play inside your head. 67 year old here who has previously commented on you products. It always amazes me how your descriptions of social phobia match my history exactly. Now you write a blog about intrusive memories which precisely describes me. I have hundreds of intrusive memories that go back to when I was six years old. They can randomly pop into my head at any time and induce a wince. There is much written today about gay and transgender people knowing they were different at a young age. I knew I was socially different from other people beginning in kindergarten. Apparently something was noticed because I was introduced to the school psychologist by the first grade. Needless to say, as with so many other social phobics, school, particularly high school, was a horror story. At age 25 I met a lady, we lived together and got married. It was not until many years later that we realized that what we had in common was we were both social phobics. After about forty years together she passed away in April 2015. We were very happy but in those forty years we never gave a dinner party, rarely visited other people and were happy just interacting with each other. I was finally diagnosed with social phobia about seventeen years ago. Following my diagnosis I entered the world with a name for my pain and was determined to overcome it. I joined Toastmasters International and gave speeches,volunteered with many non-profits and took improv comedy lessons for a year. I also purchased your course which did make things easier. After being laid off in the great recession I tried to start several business and went to numerous networking groups. All failed and I was able to collect Social Security at age 62. My life has come full circle. When I was young I spent most of my time alone in my room or a basement workshop building things. My happiest times were during the summer with no school. Unless I had chores to do I could do what I wanted,alone, and did not have to interact with anyone. Now that I am retired and social security/401k is paying for everything I now have an every day, summer vacation. I do whatever I feel like every day, surf the web, online education, do craft projects and cook. I tried to change for fifteen years out in the world before realizing that there is nothing wrong with me. I have accepted who I am and have dropped Toastmasters and all the other activities and have resurrected the kid on summer vacation, doing what he wants, alone. No, I am not a hermit. I continue volunteering with the Red Cross, say good morning to the neighbors and go to the store. My socializing in the sense of going to parties, networking and hanging out conversing is finished. I write this partially as a cautionary tale. By age fifty when I was diagnosed there was far too much conditioning to overcome. If you are younger, in your teens, twenty’s or thirty’s learn from Sean’s experience to overcome your social phobia. I am convinced that it severely limited my earning potential and life experiences over the years. Hey sean, i have the fear of sweating all the times….. whether it is social gathering, meeting with boss etc…. i have in my mind that while entering in the room fan must be on. If it is off then i started feeling nervous and starts sweating… i thought at that time that i am not able to take breathe….. plzzz help me…. it continously ruined my life…….